Every boxer in the world knows how vital their footwork can prove to be in their practice or their fight. Everything starts with the footwork, and your punches might be stronger than your opponent’s punches, but if you are unable to move properly, there are odds that you will be visiting the canvas soon. Often, speed tends to compensate for weak punches and keep you going, but if you want to be the kind of boxers that win titles, you will definitely need a good pair of boxing shoes. However, with the market littered with so many brands and models nowadays, choosing the best boxing shoes is very difficult for anybody, especially if you are new to buying this kind of product. That is where we come in, thankfully, and in this article, we will be leading you on a journey into the world of boxing shoes. You will get a chance to read in-depth reviews of our top picks for the best boxing shoes, but first, check out the several features you need to consider before buying a pair of boxing shoes below. If you are really serious about your boxing and you don’t want to end up with a pair of boxing you can’t actually use, there are some important factors you need to take into consideration before making your purchase. Your failure to follow these tips may result in you buying a pair of shoes that will not serve your needs. The first thing you should take into consideration before buying a pair of boxing shoes is the thickness of the sole. You should go for shoes with thin sole if you want more grip and control for your shoes. Nevertheless, some professional boxers have a preference for a thicker sole as they are usually more comfortable. ​Nowadays, you will find a lot of very lightweight boxing shoes that give maximum support and stability in the market. While they are usually more expensive than other shoes, you will get a real value for your money with the ultralight boxing shoes. These ultralight boxing shoes are made using advanced technology and top quality materials. Another very important thing you must take into consideration is the material used in making the boxing shoes. Manufacturers commonly use leather and various kinds of fabric to make boxing shoes. However, pure leather is the most comfortable and softest material used for making boxing shoes. The quality of your shoes is a very important thing to take into consideration, of course. If you want a high-performance pair of boxing shoes that will last you for several years, then you should go for a well-known brand. 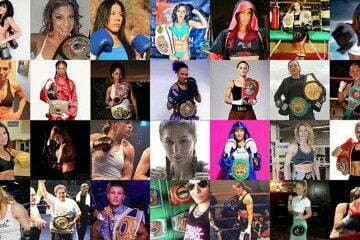 As far as boxing shoes are concerned, Adidas and Nike are the leading companies and are mostly used by most boxing professionals. When determining the quality of your boxing shoes, the main features you should look at are the materials, sole and brand. Now that we know the things to consider before buying a pair of boxing shoes, let’s take a look at our top picks for the best boxing shoes on the market. The Nike HyperKo is the first product on our list and its spot on this list can’t be questioned by anyone. They are very sturdy, durable, lightweight, and built to last, and for you to have an idea about the reliability of these boots, they have been used by famous professional boxers, like Manny Pacquiao and Andrzej Fonfara. Furthermore, the boots come with a grooved rubber sole that enables you to have excellent control with each movement and the top quality rubber will give you better grip, giving you better stability and balance. These shoes are enhanced for better punching power by designing the shoes to offer more support in the major areas that torque is generated from. With this pair of boxing shoes, you will never have to worry about heat to your feet and thanks to its excellent built and breathable mesh, be guaranteed that your feet will remain cool and dry no matter how long you wear these shoes. In general, the product looks really awesome, and with the excellent support, lightweight, and excellent grip, these shoes are ideal for training or matches. 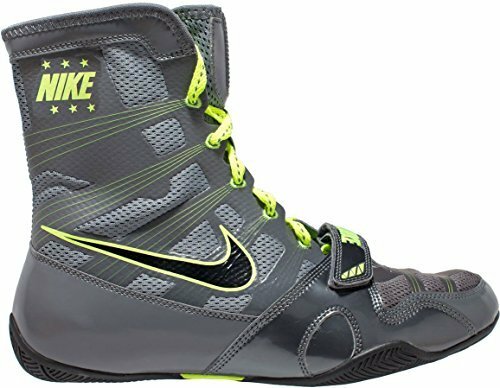 If you are looking for a pair of boxing shoes you can rely on, the Nike HyperKo Boxing Shoes is the one to go for. Adidas is a name that is respected by many people all over the world as far as the manufacturing of shoes is concerned, perhaps that is why you probably won’t find it surprising to see the Adidas Adipower Boxing Boot on this list. The Adipower is an expensive, top-quality Adidas boxing shoes designed for professional competitions. 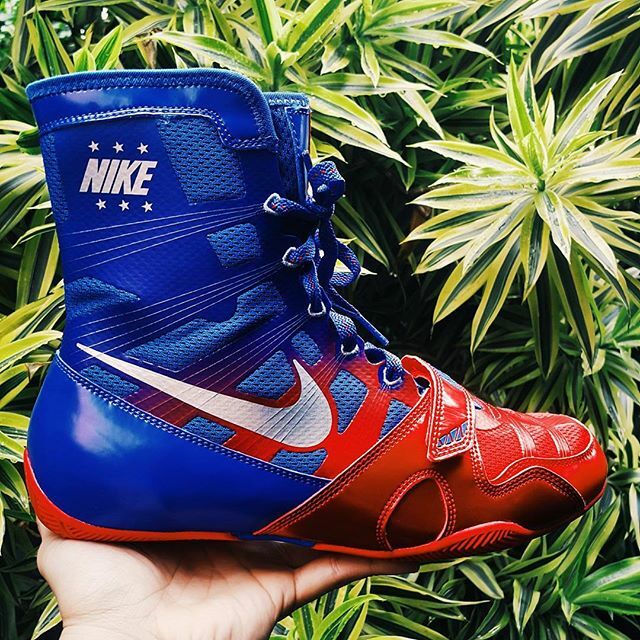 These shoes are popular with Olympic boxers, although some professional boxers such as Erislandy Lara use them in matches too. These shoes are made from a vented mesh that covers the whole body to really enable breathability. The most outstanding feature of the shoes is a sort ribbed supportive mesh that is arrayed in a semi-circle along the back of the shoe, which adds much more steadiness to the back region of the shoe and the angle. This makes the shoes really good for providing excellent support when twisting the foot and unites your whole foot into one unit when you are punching at angles. The Adipower are perhaps Adidas’ most popular boxing boot of pro level and, if you want to go with Adidas for serious boxing shoes, are the shoes we recommend for you to purchase. Reebok is an all too familiar name when it comes to the manufacturing of shoes and the Reebok Men’s Boxing Boot-Buck Sneaker is another impressive offering from the company. 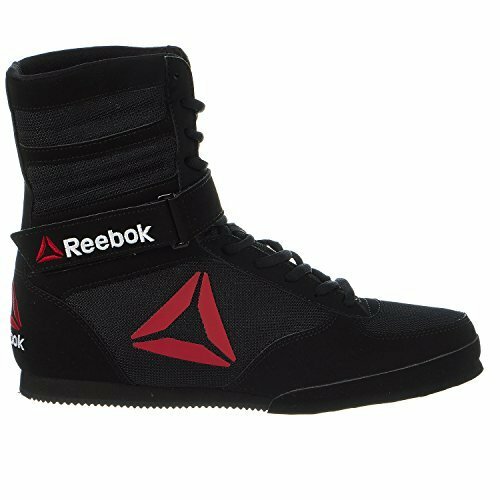 The Reebok Boot-Buck Sneaker is made of synthetic material, and it is built to take you through long fights and those with very high intensity. The shoe has a lightweight feel and also enables you to get better grip and control with each movement. In addition, the shoe features a very durable nubuck upper. Besides, the shoe features a very durable ankle strap to give better support and excellent locked-in feel. Also, thanks to the EVA cushioning, the midsole of this shoe gives more comfort and you will get a comfortable feel regardless of the duration of your fights. Furthermore, the shoe is made with a full rubber outsole to give better durability and traction. This enables you to have better balance and stability for every punch you throw. These shoes are the kind of shoes built to help you win titles, and if it makes you sleep better at nights, former boxing champions such as Floyd Mayweather and Amir Khan have used these shoes in the past. However, this shoe might not really be good for people with narrow feet as the sizes are surprisingly bigger than the normal size in reality. Nevertheless, this is a great boxing shoe you can rely on. If you are looking for a capable alternative to the Adidas Adipower, the Cleto Reyes Boxing Shoes are the perfect choice for you. The shoe is very comfortable and durable, thanks to its genuine leather and suede construction. Like the Adidas Adipower, the Cleto Reyes Boxing Shoes also belong to the “higher price” category, but offer a marginally different feel and look. They are suitable for people who prefer the feel of high tops snugged into the calf. 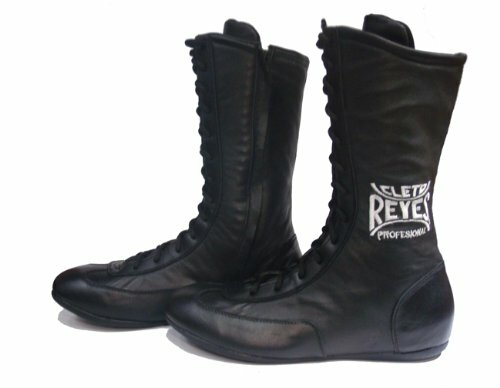 The Cleto Reyes Shoes are real high top boxing shoes, and they ride high up onto the shin. They however offer incredible support and stability. Also, the material is flexible, being built from genuine leather. As a result of that, the shoe sides are comfortable, soft, and subtle — regardless of the fact that they are high top. Additionally, thanks to the side zipper feature, it is easy to pull on the Cleto Reyes Boxing Shoes. All you need to do is slip them on, zip them up, and cinch the laces up and you are good to go. These shoes are especially built to take you through tough and intense matches, and that is why a professional boxer like Robinson Castellanos has used them at various stages in his career. 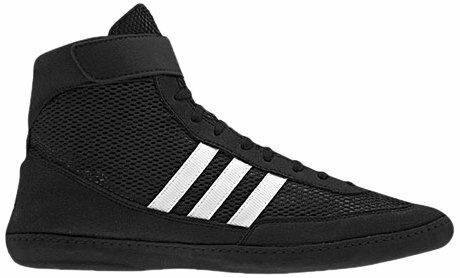 The last product on our list is the Adidas HVC2 Speed Shoes, and while they are wrestling shoes originally, people often use them as boxing shoes due to their incredible versatility and affordability. They are very durable, sturdy, affordable, and are sure to serve you for many years. In the design of the shoes, there is a combination of synesthetic leather and suede to give you a very lightweight feel. Besides, it features a special elasticized lacing for extra support and durability to your feet. Due to its full length rubber outsole, this Adidas shoes are among the best boxing shoes when it comes to the superior grip offered in the boxing ring. Besides, the shoe has a single layer mesh which gives it excellent breathability, and enables your feet to remain dry and cool regardless of the length of your fight or training. 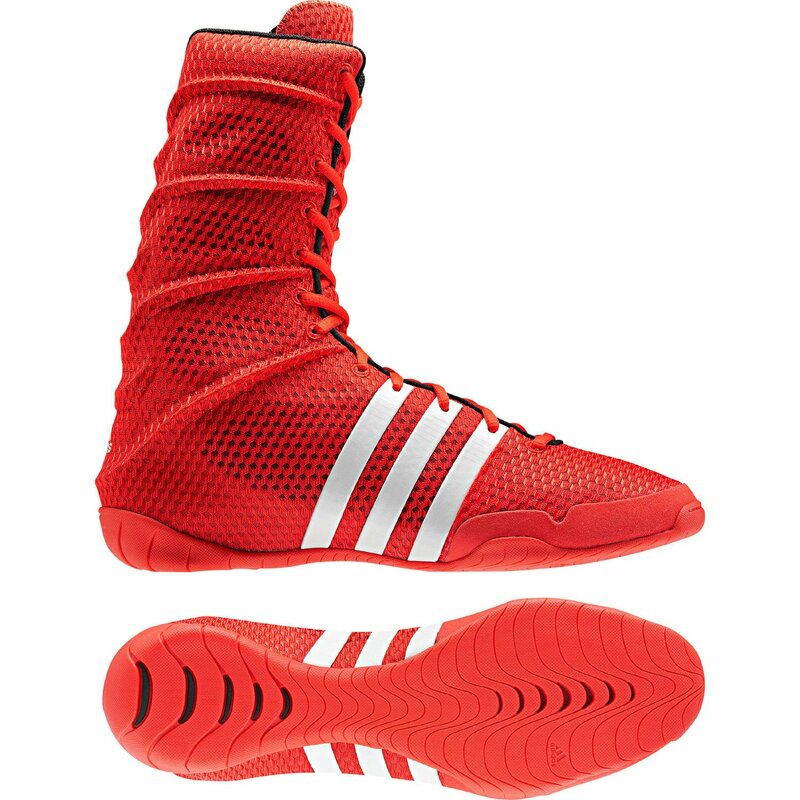 If you are looking for a wrestling shoe that is also perfect for boxing, the Adidas HVC2 Speed Shoe is the one for you.